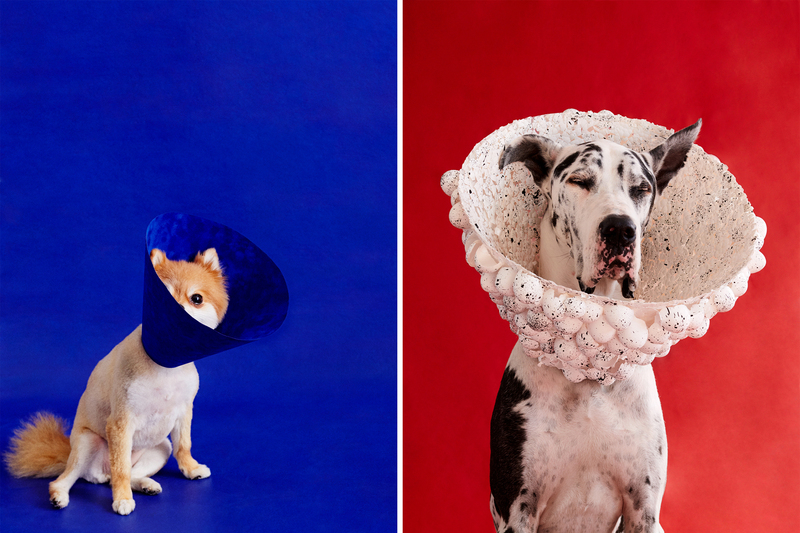 Photographer Winnie Au wanted to capture the range of emotions dogs feel while wearing these conical contraptions. 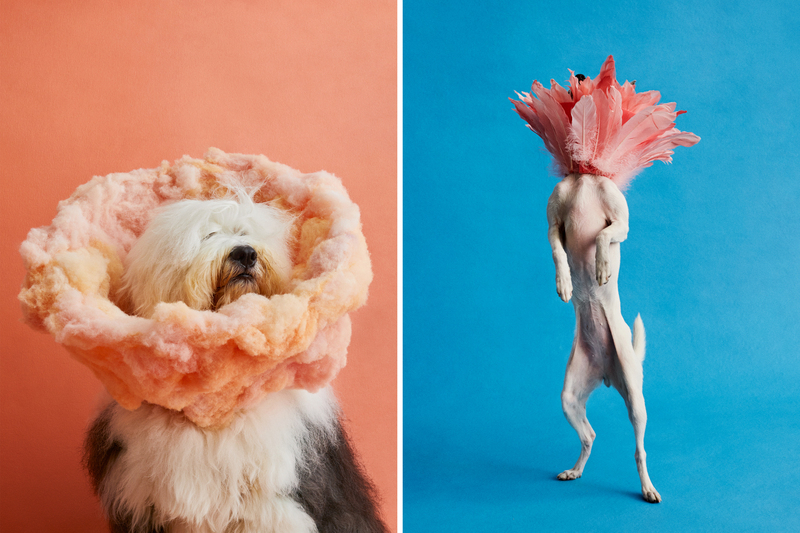 In Cone of Shame — a nod to another of the device's popular nicknames — Au's stylized portraits show dogs of all breeds looking everything from grand to dazed. In the portraits, sculptural cones serve as textural elements and pop against vibrantly colored backdrops. Au manages to heighten the dogs' surreal experience as they peek around the edges of the cone or close their eyes in disbelief. Au usually photographs human models and celebrities, but her love of dogs inspired her to create this series. She partnered with prop stylist Marie-Yan Morvan on fabricating the cones. The props are lightweight and were carefully crafted to be comfortable and nontoxic for the pups. Getting dogs to display an array of emotions on set wasn't difficult. One pup was so comfortable in the cone, it fell asleep while standing up. Another time, Au had to chase a super excited dog around set to get a photo. Au wants to use the series to help raise money for rescue dogs in and around New York City who need surgeries. She plans on launching a Kickstarter campaign to sell limited edition prints and notecards from the photo series to benefit Animal Haven, an animal shelter in the New York City area. I've always wanted to capture [images of dogs wearing cones] because it is so ridiculous to start with — but I knew I wanted to do a series because ... when a dog wears a cone, it's the saddest feeling. They just don't look very happy usually. It's a sad and ridiculous moment when they have to wear that cone. I wanted to create a series to turn that image upside down. The series is a mix of sadness and beauty. My goal was to show off dogs in a beautiful way, but also bring attention to that fact that lots of rescue animals need surgery. I thought this would be a fun way to do that. Any memorable moments with a dog on set? The sheepdog almost didn't make it to the photo shoot. The trainer's car broke down on the way to the photo shoot, and it was very dramatic. We had another person go pick up the dog. 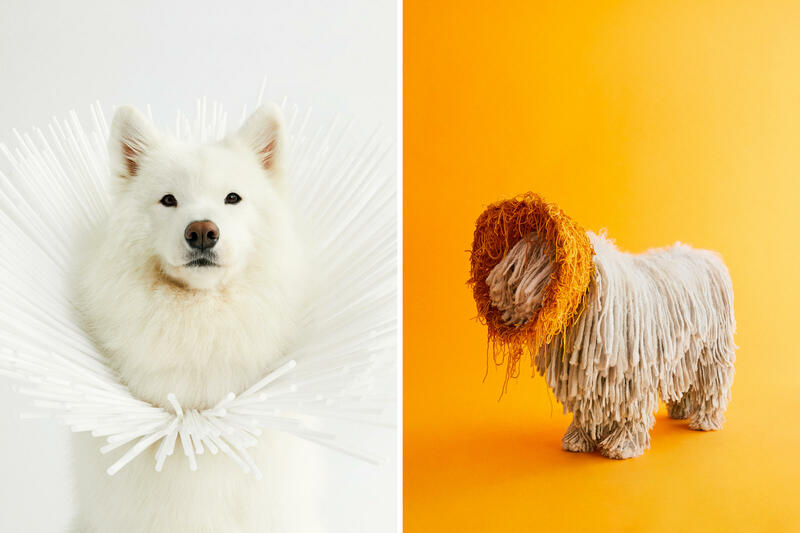 So many people worked together to get the dog to the photo shoot, but luckily he made it. The transport of dogs in general was a very complicated logistical thing for the shoots. I see that you have a basset hound. Would she ever participate in this type of shoot? [Clementine] has very specific limitations, and she doesn't really like photo shoots. In general, she's a rescue dog, so she doesn't like a lot of movement and noises. Last question: Were they all good dogs? As a dog lover, I feel like all dogs are good dogs. Were they always perfectly behaved dogs? Then I would say, not always. It's not because they are poorly trained. It's usually that the photo shoot environment is not normal for a dog.